ابرغانی, اکبر, صحرایی, محمود. (1397). تاثیر تغذیه کمکی بر کاهش وزن بره های مغانی در هنگام کوچ. فصلنامه محیط زیست جانوری, 10(4), 107-112. اکبر ابرغانی; محمود صحرایی. "تاثیر تغذیه کمکی بر کاهش وزن بره های مغانی در هنگام کوچ". 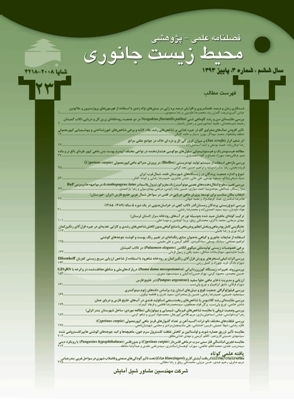 فصلنامه محیط زیست جانوری, 10, 4, 1397, 107-112. ابرغانی, اکبر, صحرایی, محمود. (1397). 'تاثیر تغذیه کمکی بر کاهش وزن بره های مغانی در هنگام کوچ', فصلنامه محیط زیست جانوری, 10(4), pp. 107-112. ابرغانی, اکبر, صحرایی, محمود. تاثیر تغذیه کمکی بر کاهش وزن بره های مغانی در هنگام کوچ. فصلنامه محیط زیست جانوری, 1397; 10(4): 107-112. یکی از مسایل و مشکلات گله ­های عشایری استان اردبیل افت وزن گوسفندان بالاخص بره‌های مغانی در حین کوچ می‌باشد، با عنایت به جمعیت قابل توجه نژاد مغانی، طرحی در قالب کاملا تصادفی با تکرار نا­مساوی در هر تیمار انجام گرفت. تیمارهای آزمایشی شامل کوچ پیاده بدون تغذیه کمکی (شاهد)، کوچ پیاده با تغذیه کمکی، کوچ ماشینی بدون تغذیه کمکی، کوچ ماشینی با تغذیه کمکی و کوچ ماشینی در ساعات خنک شبانه بودند. این پژوهش به­ منظور مشخص کردن مقدار افت وزن و تعیین اثر روش کوچ بر تغییرات وزن بره­ ها اجرا گردید. تیمارهای مختلف اثر معنی‌داری بر روی افت وزن بره‌ها داشت (0/05>P)، روش کوچ پیاده بدون تغذیه کمکی با داشتن بیش ­ترین مقدار افت وزن به ­ازای هر رأس بره (2/65‌ کیلوگرم) نسبت به سایر روش­ ها اختلاف معنی ‌داری را نشان داد (0/05>P). کم ­ترین مقدار افت وزن در روش کوچ ماشینی با تغذیه کمکی مشاهده گردید (65گرم). مقایسه اقتصادی روش­های مختلف کوچ با روش حداقل هزینه نشان می ­دهد که کوچ ماشینی توام با تغذیه کمکی نسبت به روش ­های دیگر سود بیش ­تری دارد. علی ­اکبرزاده، ا.، 1379. رابطه بین نظام مالکیت و تخریب مراتع در استان اردبیل. نشریه سازمان مدیریت و برنامه‌ریزی کشور. شماره 286. علی ­اکبر‌زاده، ا.؛ نوری، ق. و شریفی، ج.، 1378. مطالعات جامع توسعه اقتصادی، اجتماعی و فرهنگی استان اردبیل. بخش پوشش گیاهی. انتشارات سازمان مدیریت و برنامه‌ریزی استان اردبیل. منعم، م.؛ اسماعیلی ­راد، ا. و دخانچی، س.، 1367. طرح شناسایی گوسفندان بومی ایران (گوسفند مغانی). مؤسسه تحقیقات علوم دامی کشور. نشریه پژوهشی شماره 57. Blackwood, I. and Hurst, R., 2004. Types for transporting cattle and sheep. New South Wales Departement of Primary Industries: Agriculture. New South Wales Government Agnote DAI-234. pp: 1-11 (Second Edition). Broom, D.M., 2000. Welfare assessment and welfare problem areas during handling and transport. (In: Livestock Handling and Transport. Ed. T. Grandin). CABI Publishing, NewYork, NY. pp: 43-61. Cockram, M.S. ; Kent, J.E. ; Goddard, P.J. ; Waran, N.K. ; Jackson, R.E. ; Megilp, I.M. ; Southall, E.L.; Amory, J.R.; Mcconnell, T.I. ; Riordan, T.O. and Wilkins, B.S., 2000. Behavioural and physiological responses of sheep to 16h trasport and a novel environment post-transport. Journal of Veternary. Vol. 159, pp: 139-146. Fuente, J.D. ; Sanchez, M.; Perez, C.; Lauzurica, S.; Vieira, C. and Chavarri, E.G., 2010. Physiological response and carcass and meat quality of suckling lambs in relation to transport time and stocking density during transport by road. Journal of Animal Science. Vol. 4, pp: 250-258. Gonyou, H.W., 2000. Behavioural principles of animal handling and transport. (In: Livestock Handling and Transport. Ed. T. Grandin). CABI Publishing, New York, NY. pp: 15-25. Grandin, T., 2000. Recent sheep transport research. (In: Livestock Handling and Transport. Ed. T. Grandin). CABI Publishing, New York, NY. pp: 230-234. Grandin, T., 2001. Perspective on transportation issues; the importance of having physicalley fit cattle and pigs. Journal of Animal Science. Vol. 79, pp: 201-207. Knoweles, T.G. ; Warriss, P.D. ; Brown, S.N. ; Ketin, S.C.; Rhind, S.M. ; Edwards, J.E. ; Anil, M.H. and Dolan, S.K., 1993. Long distance transport of lamb and the time needed for subseqent recovery. Journal of Veternary. Vol. 133, pp: 286-293. Knoweles, T.G. ; Warriss, P.D. ; Brown, S.N. ; Kestin, S.C.; Edwards, J.E. ; Perry, A.M.; Watkins, P.E. and Watkins, A.J., 1996. Effects of feeding, watering and resting intervals on lambs transported by road and ferry to France. Veternary Record. Vol. 139, pp: 335-339. Knoweles, T.G. ; Warriss, P.D. ; Brown, S.N. and Edwards, J.E., 1998. Effects of stocking density on lambs bening transported by road. Veternary Record. Vol. 142, pp: 503-509. Lemea, T.M. ; da Cunha, S.; Titto, E.A.L. ; Titto, C.G. ; Amadeua, C.C.B. ; Netoa, P.F. ; Vilela, R.A. and Pereira, A.M.F., 2012. Influence of transportation methods and pre-slaughter rest periods on cortisol level in lambs. Small Ruminant Research. Vol. 107, pp: 8-11. MAFAAEI. 2004. MAF standard for the transport of cattle by sea from New Zeland. Ministry of Agriculture and Forestry Animal Imports and Export, New Zealand Government, Wellington, NZ. pp: 1-9. MAFAWG. 2003. Welfare of Sheep, Goats and Cattle Transported by Truck Within New Zealand. Pocket Guide for Stock Truck Drivers. Ministry of Agriculture and Forestry Animal Welfare Group, MAF Biosecurity Authority, Wellington, NZ. pp. 1-6. Manteca, X., 1998. Neurophysiology and assessment of welfare. Procedindg International Congrees. Meat Science Technology. (Barcelona, Spain). Vol. 44, pp: 146-153. Smith, G.C. and Grandin, V., 1998. Animal handling for productivity, quality and profitability. Presented at the Annual Convention of the American Meat Institute (Philadelphia, PA). Foundation, Animal Handling and Stunning Conference (Kansas City, Mo). pp:1-12. Smith, G.C. and Grandin, T., 1999. The relationship between good handling/ stunning and meat quality. Presnted at the American Meat Institute Foundation, Animal Handling and Stunning Conference (Kansas City, MO). pp: 1-22. Sutherland, M.A. ; Bryer, P.J. ; Davis, B.L. ; Smith, J.F. and Mcglne, J.J., 2012. The combined effects of transport and food and water deprivation on the physiology of breeding age gilts. Livestock Science, Amsterdam. Vol. 144, No. 1-2, pp: 124-131. Tarrant, V. and Grandin, T., 2000. Cattle Transport. (In: Livestock Handling and Transport. Ed. T. Grandin). CABI Publishing, New York, NY. pp: 151-173. VonBorell, E.H., 2001. The biology of strees and its application to livestock housing and transportation assessment. Journal of Animal Science. Vol. 79, pp: 260-267.